LT Huston and several enlisted men were sent on deck in heavy seas to sever a loose mooring line that was trailing behind the submarine and was in danger of fouling the propellers. After severing the mooring line, the men were attempting entry into the superstructure when one enlisted man was washed off of his feet by waves. 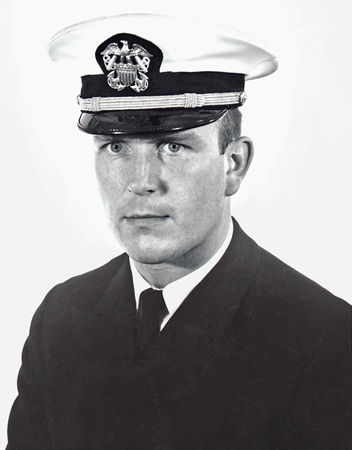 LT Huston was able to pull the man to safety, but then he was struck by a wave and washed overboard when his safety line became undone. Photo, information, and remarks courtesy of Paul Roggemann, fellow submariner.